Knoxville and Clinton-area business owners are responsible for keeping their premises in reasonably safe condition for customers and other invited guests. When a business has “superior knowledge” of a hazard that might lead to injury, there is a duty to warn customers. If the business fails to give such warning and the customer is then harmed, the owner may be liable for damages in a personal injury lawsuit. Business owners are quick to try and shift the blame to customers for on-premises injuries. And while a customer’s knowledge of a hazard may be relevant in determining comparative fault–which can affect the ultimate award of monetary damages–it does not automatically absolve the business owner of liability. Indeed, even if a customer has partial knowledge of a possible hazard, in many cases the business owner may still possess additional information that necessitates a warning. For example, the Tennessee Court of Appeals recently reinstated a personal injury lawsuit brought against a Knoxville-area chain restaurant. The plaintiff was hurt in a slip-and-fall accident on the restaurant’s premises. Although the trial court held on summary judgment that the restaurant did not have “superior” knowledge of the hazard that led to the plaintiff’s injuries, the Court of Appeals said the facts showed otherwise. The plaintiff worked for a local company that placed a takeout lunch order with the restaurant. The order included several drinks and “at least one bag of ice,” according to court records. The plaintiff picked up the entire order, including two bags of ice, and started to leave the restaurant when she slipped and fell. 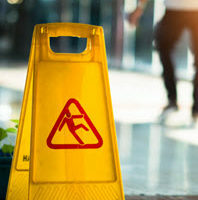 Although the floor was free of water or any similar hazard when the plaintiff entered the restaurant, she testified that she “was soaked” when she fell. She identified the bag of ice, which partially melted, as the cause of her fall. The restaurant’s manager confirmed in his own testimony that “condensation from the bag of ice that [the] Plaintiff picked up dripped on the floor” and caused her to fall. In other words, the restaurant knew how long the bag of ice had been sitting out before the plaintiff came to pick it up. This constitutes “superior knowledge,” triggering a duty to either warn the plaintiff or at least leave the ice in the freezer until she arrived. Given the existence of this duty, the Court of Appeals said the trial judge erred in granting summary judgment to the restaurant. Whether it involves premises liability or an auto accident, establishing a defendant’s duty to the plaintiff is critical in proving negligence. An experienced Tennessee personal injury lawyer can help in building and proving your case in court. Contact the offices of Fox & Farley, Attorneys at Law, in Clinton or Knoxville today if you need to speak with a lawyer today.